The Olathe school district had a $16 million payroll increase last year as part of the legislature’s 6-year / $1 billion funding increase offered up to appease the Kansas Supreme Court. The new money is theoretically intended to improve student achievement but the Legislature (again) failed to include any real accountability measures to ensure money was effectively spent. KPI scholar David Dorsey was a teacher in Topeka following the last court-ordered funding increase in Montoy and says not much changed in how his district operated except everyone got a nice pay increase. Based on this analysis of the Olathe school payroll and their employment reports, it appears to be ‘business as usual’ again. 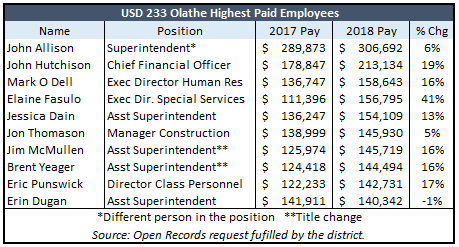 The ten highest paid Olathe school administrators received an average 13 percent pay increase last year according to data provided by the district in an Open Records request. The district’s total payroll increased by 8.5 percent but a good portion of that is attributed to hiring more staff; fulltime equivalent employment increased by 4.4 percent. Payroll amounts include all forms of pay (salary, overtime, bonuses, stipends, etc.) but no benefits. Superintendent John Allison tops the list at $306,692; that’s 6 percent more than the interim superintendent received the year before but $40,000 more than Allison was paid in 2017 as superintendent of the state’s largest district in Wichita. Two of the top ten had title changes that indicate significant change in duties (to Assistant Superintendent) but the largest increase – a 41 percent bump from about $111,000 to $156,000 – went to Elaine Fasulo. She was listed as Director of Special Services in 2017 but now is called Executive Director of Special Services. Chief Financial Officer John Hutchinson’s pay jumped 19 percent to a little over $213,000. The complete Olathe school payroll can be viewed and downloaded here at KansasOpenGov.org. The education lobby said the new money would be very specifically targeted to hire counselors, psychologists and other staff to improve outcomes and close achievement gaps. And that’s what they did with some of the money, but they also hired more staff in many other areas. Department of Education employment reports show Olathe hired 1.5 more psychologists and 4.5 more counselors, but the district also hired 8 more managers. Sixteen more classroom aides were hired, but 19 more clerical positions were added. Overall, the district added 166 fulltime equivalent employees. There were 83 more teachings positions reported on employment reports, which looks good on the surface, but a deep dive into the payroll listing shows the biggest gain was in substitute teachers. Keep in mind, the payroll listing is the number of people who received a paycheck so more turnover means more paychecks but not necessarily more employees…and because of turnover, there will always be more paychecks than employees over the course of a year. 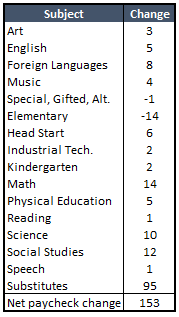 There was a net increase of 153 paychecks given to the teaching categories shown in the adjacent table, compared to a net increase of 83 fulltime equivalent teachers. Since the 95 additional substitute teachers are likely part time employees, it makes sense that the net increase in FTE teachers is just 83. This means the net increase in teachers most likely to improve achievement for students performing below standards is a much lower number. Remember, the court’s rationale for saying schools are underfunded is that about a quarter of students are performing below grade level on state assessment tests. It’s not that there’s no value in teaching Art, Japanese, Music or Physical Education (for example) but subjects like these don’t represent the below-grade-level shortfalls. If the big jump in substitute teachers means regular teachers are reporting off more frequently, that further diminishes the impact on student performance. Doing the same thing over and over again but at higher prices won’t help students. But until legislators and governors are willing to resist pressure from the education lobby and really hold schools accountable, taxpayers will be spending a billion dollars more and it’ll be déjà vu all over again for students.